In almost every case, the cheaper the food, the less nutritious while the more expensive foods are the most rich in nutrients. 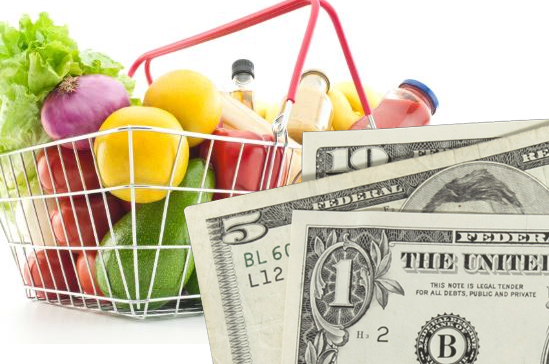 Well what if we told you that you could still eat healthy on a reasonable budget? Here today is guest blogger, Ann Neal, with some super helpful ways in how to save and eat healthy meals! How many times have you thought about eating healthy and the rejected the plan just because you think healthy eating costs more? This is the reason why more and more Americans are munching on cheap and unhealthy foods which have given rise to massive obesity problems around the country. But it does not need to be this way, even if you are on a tight budget. While it can be a bit difficult to eat healthy with a tight budget, you can achieve this goal by planning ahead. Meal planning helps you reduce the overall cooking time (which saves gas costs), cut down grocery costs and also allows you to prepare your (and your family’s) favourite foods. Save one day of the week for planning your meals for the upcoming week. This helps you save a lot of time and money, since you exactly know what to get from the grocery stores and what to cook for in a particular day. List 15 to 20 healthy recipes that you and your family love. Ideally you should choose recipes that are healthy and can be made with help of inexpensive ingredients. We Got Real has come up with a list of the most inexpensive food ingredients that have high nutritional values. Some of these are eggs, lentils, mushrooms, tofu, sweet potatoes, etc. Once you have the list of recipes, it is time to build the shopping lists. Get an idea about the amount of ingredients required for each recipe and the number of times you are going to prepare the specific recipe. Add up the ingredients to get total amount of ingredients required. Cancel the ingredients you already have. Post the meal plans in a place where you will be able to see them regularly. Meal planning reduces impulsive eating and shopping, so you can keep a check on the amount you spend every week on food. The top food brands and food chains constantly try to entice people with marketing messages that scream ‘It’s cheap’, ‘It’s delicious and you’ll love it’, etc. which makes it even more difficult for people to eat healthy. Moreover, slashing prices on unhealthy food has induced many people to choose unhealthy foods over healthy ones, especially when the economy is challenging. Thus the hurdles are many. But in order to make sure you and your family stay fit and healthy, you need to find out ways to control your budget without compromising your eating habits. For this you need to stick to your grocery lists and avoid advertised specials. Supermarkets use creative and enticing ads to allure the consumers, but most of the times the sales are not real deals. If you can’t control impulsive shopping, order groceries online through websites and apps. This way you will only order things you’ll need. One more tip – order in bulk. Ordering in bulk might mean more cost upfront, but it can save you time and money in the long run. Look out for outlets that offer wholesale rates and once you find them order in bulk. Coupons and freebies are a great way to save money, but you need to be very careful while using coupons since most are available for unhealthy and processed foods. Browse through the coupons or look for health freebies on various websites offering coupons and free health products. Maintaining a kitchen garden can help you cut your costs, eat healthy and stay fit. You can grow a small kitchen garden even if you have a small garden. Try growing seasonal vegetables and fruits and find out ways to preserve them, so that you can use them for a long period of time. You can also grow herbs that you regularly need to cook your meals. Square foot gardening is an effective way of growing your own produce, when you have a very small garden. The next best way to save money and eat healthy is to cook at home. Take out some time from your busy schedule and prepare bulk meals, so that you have supplies for several days. You can also consider re-purposing the meals to create new dishes. Add some new ingredients or make some quick dips at home to make the food taste different. Seasonal produce are cheaper than off-season veggies and fruits. Seasonal veggies and fruits are tastier and high in nutrients as well. So plan your meals accordingly. Off season produce are preserved using chemicals which are not good for your health, so avoid them by all means. Also try to buy the seasonal produce in bulk, to get cheaper rates. You can also consider freezing the excess supply for future use. Meal planning might sound easy but in reality it can be quite tough to manage the budgets and eat healthy. In order to learn the art of planning your meals, create a strategy that prevents wastage, impulsive shopping and encourages saving. Contrary to what many people think, you don’t have to break your bank to eat healthy, just know your food habits well and cook right and buy the right (and cheaper) ingredients. Healthy eating cannot be achieved in one day, especially if you have been living on junk foods till now. Motivate yourself to eat healthy! This will not only help you save money on monthly meal budgets, but will also help you cut medical costs and lethargy. Do you have any tips to add to this list?